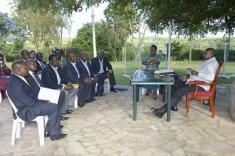 President Museveni this afternoon met Directors of Geothermal Drilling Systems International (GDSI) at his country home in Rwakitura. GDSI, a Kenyan based company was led by Mr. Amos Njogo, one of the directors. Other directors include Mr. Bob N. Michuki and Paul M. Murethi.